Because of the many incidents of “goosing” in Gridley in 1911, Gridley was the first to pass an ordinance against it. As far as we know, we are the only town in the U.S. that has such an ordinance. Making it unlawful for any person to practice what is known as “Goosing” another person, and fixing a penalty for the same. Section II. Any person convicted of the violation of Section I of this ordinance shall be fined in any sum not to exceed twenty-five dollars and shall stand committed to the city jail until said fine and costs are paid. 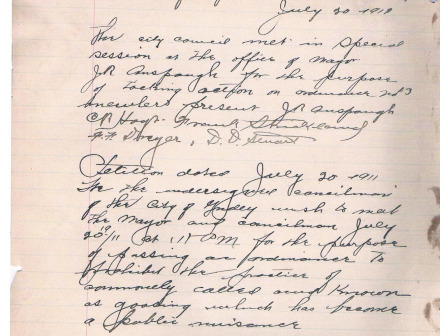 Passed by the council and approved by the mayor, in special session, this 20th day of July, 1911. J.R. Anspaugh, Mayor. C.E. Pilcher, City Clerk. The ordinance attracted attention across the country with some expressing approval and others expressing some not so serious comments. As far as we know, the ordinance has never been repealed. The original minutes of the special session and the published ordinance can be seen at the Gridley City Hall, 503 Main, Monday - Friday 7:30 a.m. - 1 p.m.